Marriage is the most important thing in everybody's life. Success of a marriage totally depends on the compatibility of the two partners. However, before that comes finding a suitable match. Matrimonial Sites are of great help for finding a soul mate. One just needs to have a good Online Matrimonial Profile and there will be no shortage of suitable grooms and brides. Online Matrimonial Sites are reliable, convenient and make the task of match finding very easy. While creating an Online Matrimonial Profile one should consider certain things to get the maximum number of best available options. Some of those points are listed below. Recent Photo : Photos generate the most interest and will get you more responses as compared to photo-less profile. So do not be hesitant about uploading your photo. Only upload a recent photo so that there are no confusions caused. It is preferable that the photo should be taken by a professional photographer and in a photo studio. Do not overtly or very casually dress up for the photo. Full Scale Information : Filling all the sections on the Online Matrimonial Site increases the attractiveness of the profile. That is the options that will come as a result will be very specific as per the requirement the Profile. It also ensures that the other member can get to know about you in a better manner. Be Confidant In Writing About Yourself : Avoid writing long profiles. Short and crisp information is what attracts good prospects. But be sure that you give all the required information regarding marriage like educational qualification, professional background, brief description of your family members, etc. This is also where you should mention what you are looking for in a life partner. 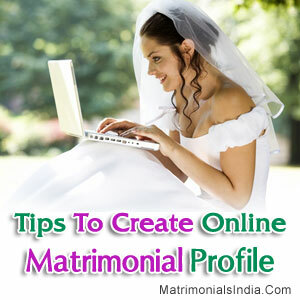 Keep Track Of Your Account : Having an Online Matrimonial Profile is not enough to get a good match. You should login to your profile regularly and should respond to those who show interest in your profiles. At the same time, initiating a response from your own side can also be a great advantage. With so many reliable Online Matrimonial Sites around, finding a suitable match becomes easy and simple.